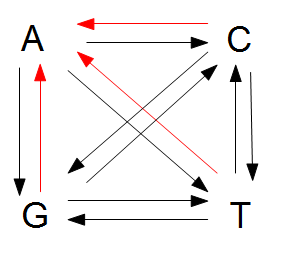 In previous posts I talked about irreversible and reversible mutations between two states or alleles. 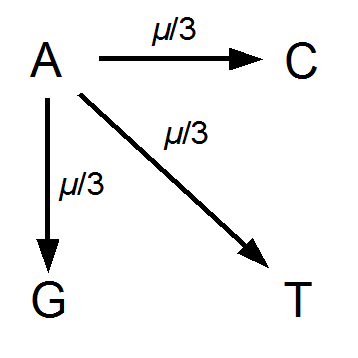 However, there are four nucleotides, A, C, G, and T. How can we model mutations among these four states at a single nucleotide site? 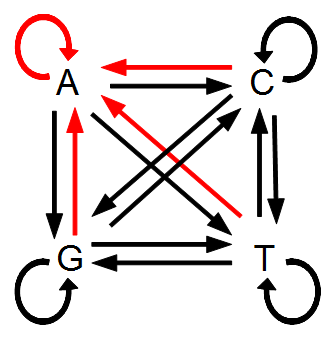 It turns out that this is important to consider for things like making gene trees to represent species relationships. If we just use the raw number of differences between two species’ DNA sequences we can get misleading results. It is actually better to estimate and correct for the total number of changes that have occurred, some fraction of which may not be visible to us. The simplest way to do this is the Jukes-Cantor (1969) model. (lower right above); the “T” could have just as easily mutated to a “G” or “C” instead of an “A”. 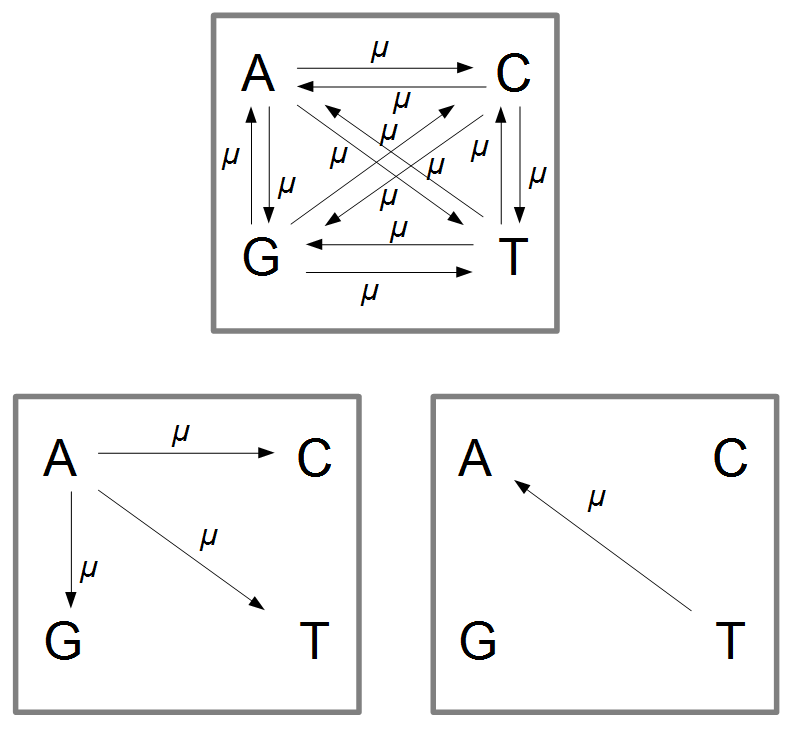 or 1/4 as the predicted frequency of “A” in a DNA sequence at equilibrium, which makes sense, if mutations occur in all directions at equal frequencies then we expect 25% of the nucleotides to consist of “A’s”. This is also true if we look at all the possible mutations simultaneously. There are three paths to “A” and nine other paths for a total of 12. 3/12=1/4. Now it’s time to talk about the Poisson distribution. 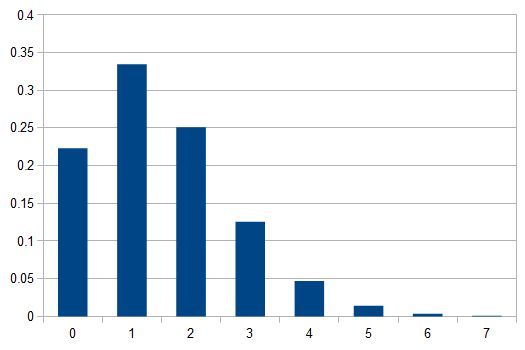 This is a convenient distribution to use in many cases where the probability of an individual event is rare, events occur independently, and we are thinking about intervals of continuous time (or space). Classic examples are the number of people in a line at the bank per hour, or the number of letters received in the mail per day, or the number of Prussian soldiers killed each year by horse kicks, or less classic, for example, the number of meteors larger than 10 meters in diameter that impact Earth’s atmosphere each decade (this happens to be slightly less than one on average). In words, the probability of no events is 22.3%, one event is 33.5%, two events is 25.1%, three events (twice the average) is 12.6%, … seven events is less than 0.1% and the probability of eight or more events, given the average is 1.5, is practically zero. 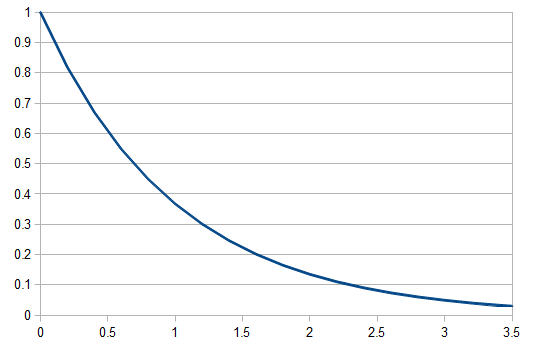 So, as the mean increases (x-axis below) the probability of zero events (y-axis) drops according to an exponential distribution. Because, with one species at one state at a site there are three possible ways to be different in the other species, and to do this at least one mutation had to occur between them. raised to a large negative value approaches zero. of the sites will happen to match because there are four nucleotides to choose from. we get this kind of curve. 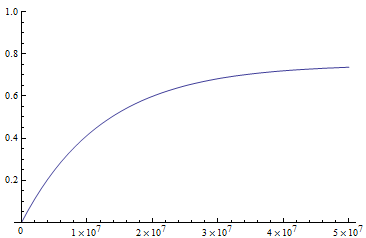 The x-axis major units are 10 million generations (or time units). The trajectory is near equilibrium at 50 million generations. Also, the per nucleotide mutation rate is much smaller than the per gene mutation rate where there are many more nucleotide sites that can disrupt the gene. , which is time linear, substitute it in and solve. 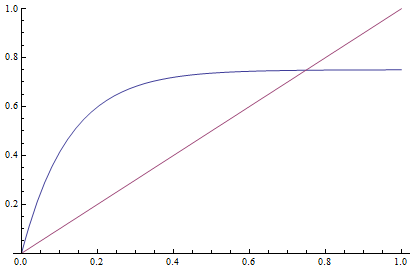 This takes the raw distance (blue curve below) and converts it (assuming the mutation model is a reasonable approximation) into a time linear distance between species (red line below). If you look up the Jukes-Cantor distance correction in other places you may see different numbers. This is because there are different ways to scale mutation when you write down the model. This entry was posted in Lessons, Tutorial on 1 August 2013 by Bob Thomson. Assistant professor in the Department of Biology at University of Hawaii Manoa. 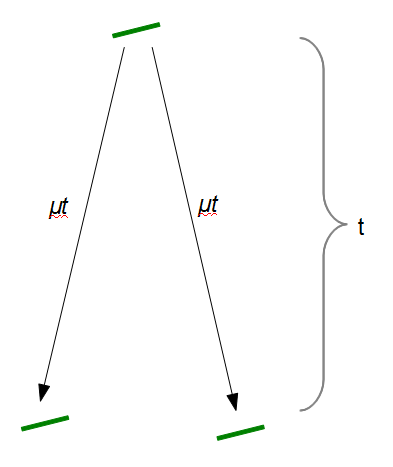 TreeThinkers is a blog devoted to phylogenetic and phylogeny-based inference. We aim to use it as a place to discuss recent research and methods; to ask and answer questions; and serve as a general resource for news and trivia in phylogenetics. Although the blog is associated with the Bodega workshop, we welcome posts and participation from the entire phylogenetics community. 2017 Bodega Bay Workshop – Apply now!